I know you've been waiting three months for this letter, but I have to start by saying that this isn't an apology. I'm not sorry.I'm not. If I have to spend the rest of my life crossing that word out of every dictionary I find, I will. So, if that's what you've been waiting for me to say, why you keep writing to me, stop reading now. They say I'm evil. The police. The newspapers. The girls from school who shake their heads on the six o’clock news and say they always knew there was something not quite right about me. And everyone believes it. Including you. But you don't know. You don't know who I used to be. This book is really difficult to talk about as I can feel myself getting emotional all over again as I try to express my feelings. I am not sure if this book just caught me at the wrong time, but I actually felt emotionally raw by the end of it. Tanya Byrne's book is so real and so powerful written yet subtle with it, it will weave your heart strings tightly together, allowing no room for escape. This book ultimately deals with how far a person will go to get revenge. At first you unsure how you feel about the main narrator, Emily. You have no idea what she has done or why she has done it, which leaves you wary. You are unsure whether she can be trusted completely. The book is written in first person in the style of a journal as Emily expresses her feelings. You witness her daily battles of give and take with her doctor. You watch her emotions rise and fall as snippets of information regarding to the events that led to her imprisonment become known. By the end of the book, I loved Emily. I am not sure whether that would be a common reaction among readers, but I understood her reasoning for her actions and believed in her. She did what she did out of love, not just hate. I didn't feel strongly for Nancy at all. I know I should have felt something for her, but I didn't. I loved Sid though, with each new description of him, I found myself swooning a little over him. There was a scene in the book that will not leave me. It concerns an old photograph with huge sentimental value and every time I think of that scene it brings tears to my eyes. The emotion created by that one small scene was immense. The writing reminds me of the style of Cat Clarke, only darker and more disturbing. The letter at the beginning grabs your emotions from the start and you know you have to finish the story, you have to find out what will happen, even if it will leave you an emotional wreck by the end. This book should come with a warning and a travel size pack of Kleenex tissues. You are going to get upset, you have to be heartless not to. By the end I felt like my feelings had been scrubbed with a Brillo pad. I felt like I had invested so much in Emily, I knew I would stand by her. I was surprised by her actions, but I understood her reasoning behind them. This book is a very emotional read. Beautifully written yet brutal in realism. If this is the author's debut book, I am seeing a string of awards in her future. It is brilliant. You must read it. I am so glad I wasn't on my own. You had me in the first line of that extract - I'm guessing most of the writing is that good and that powerful? Well, I simply must read this one now - thanks Viv! Tanya is very talented. I wish I could write just like her. It is an excellent book. It really makes you think. I loved Emily as well Viv so I'm so glad you've said this! As for Nancy... I found her bland and boring, but thats not sup rising next to Emily! Its an incredible book and this is a great review!! Excellent review, I've just posted a piece on the new cover for the paperback which is what made this book catch my eye. Will definitely be reading it soon. I was reading your review and immediately went to buy this book. I always love finding someone else who loves a book as much as I would so I can't wait to read it myself. Thank you so much! 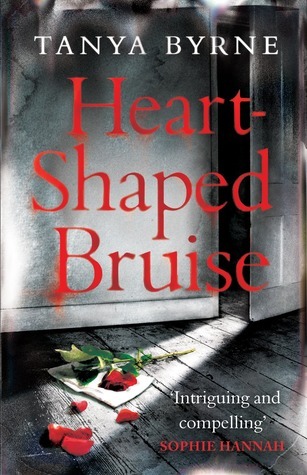 I bought heart-shaped bruise, on a whim, but it truly captivated me. I loved reading the story of Emily Koll as she struggles with the live she had built for her following the stabbing of her father. We are drawn into the mind of an eighteen year old girl as she faces a new identity in the criminally insane section at the prison.